Let me just start by saying that I’m from Los Angeles. Which means, quite frankly, that I don’t think of driving as a means of pleasure. In fact, it’s more like cage fighting. Every man for himself, bare knuckled and bloody. The only time I look to the side of the highway is to unfurl a fusillade of four letter words at the stranded motorist who turned my easy five mile jaunt into a two hour stress test. Which begs the question, why in the world would I choose to drive for nearly 500 miles when my client will gladly pay for a flight? Three good reasons: One, I wasn’t anywhere near Los Angeles. Two, well, reread reason one again so you get the idea. The third reason? I was working and had two days to kill between assignments in the South. Sitting in hotel rooms doesn’t exactly appeal to me. The open road beckons me between assignments. Flying to and from assignments is standard protocol when working for Sports Illustrated. Sometimes, though, standard protocol is monotonous enough to make me want to switch things up. I was given a nice feature to work on in Nashville on a Tuesday followed by another profile three days later in Little Rock, Arkansas. I flew to Nashville but opted for driving to Little Rock to avoid a second round of TSA pat downs and middle seat escapades. Throwing my photo equipment into the trunk of my blue Ford Fusion following the Nashville job, I headed to Montgomery, Alabama where I was to meet with some friends. I didn’t shoot during this stretch, opting instead to see if I could awaken my senses to the actual pleasure of driving. I wanted to see if I could see. See? 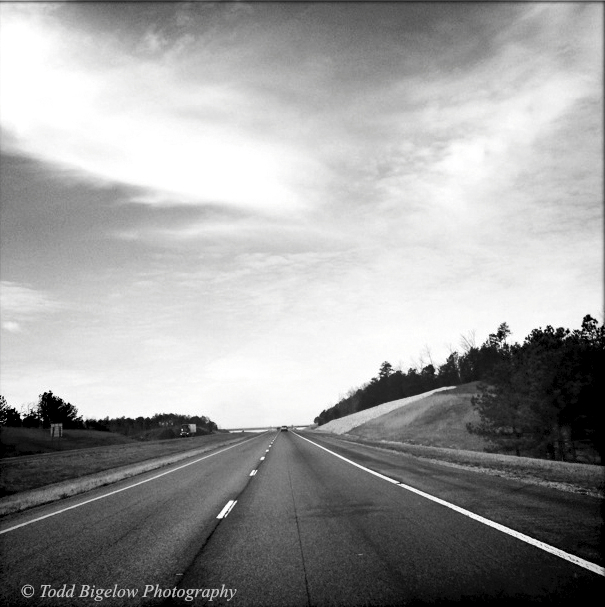 If I wanted to see things along the highway, to record the pleasures and surprises of the open road, well, I first had to make it to Montgomery without deliberately forcing anyone off the road into a muddy ditch. I’m glad to report I did! Photo gear goes in the trunk of the vehicle. No 5D on this shoot. iPhone images only shot with Hipstamatic App and processed with Snapseed App. Images must be taken within shouting distance of the highway (okay, I know that’s subjective, but you get the point. 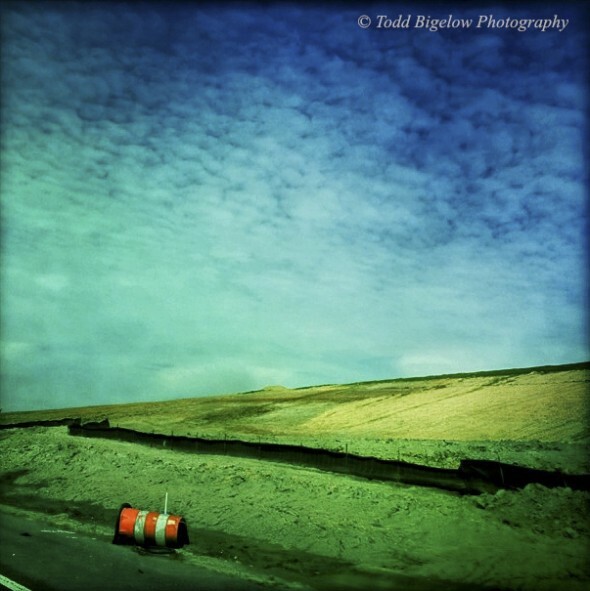 No driving way off the highway to shoot!). Images must be found, not predetermined. No turning around and going back. Once it’s in the rear view mirror, it’s history. Off I went, merging onto the two lane highway already buzzing from the espresso and excitement of a day of chance encounters. With no predetermined time of arrival in Little Rock, I felt instantly reborn! A driver resurrected with a new purpose. I was devoid of time constraints and overwhelmed with a sense of freedom, something Angelenos can only dream about when navigating the congested chaos of LA. Hell, I even surprised myself when I turned up the volume on a Bob Seger song. I mean, really, Bob Seger? I was feelin‘ it. I was in the zone. The first thing I noticed is that at 70 mph I saw everything when I was passing it. I immediately considered changing the rules of the game figuring they were my rules and I was the only one playing the damn game anyway. But I decided that would be sort of pathetic, even by my own pathetic standards. So despite a poor performance in my first few miles, I decided to press on with the original rules in tact. But just for the record, that long line of rail cars stretching into the woods and overflowing with coal that I saw from a overpass? That would have made a great shot, but you’ll just have to take my word on it because I live life by the rules. 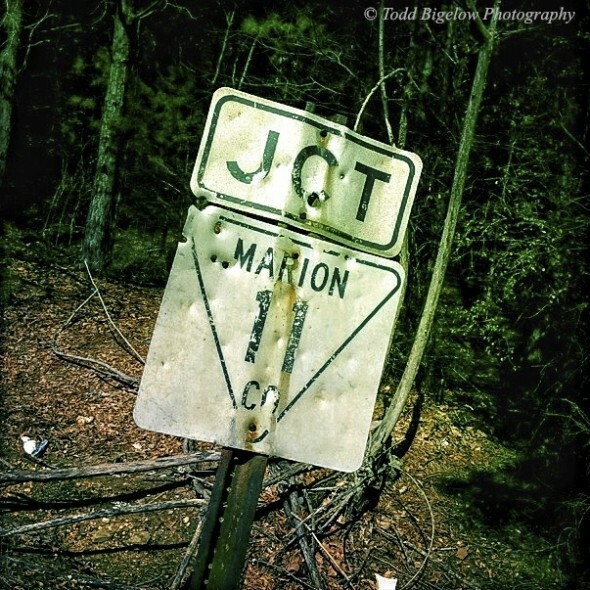 A roadside memorial early in my journey made me think about who “Joe” was and how he died. Second thing I noticed was truckers absolutely hate when you slam on the brakes and dive onto the shoulder of the highway. Like I care. I was on a quest. My luck soon began to change for the better. I was now seeing things before flying by them, no doubt a result of being free of a schedule. I spotted a roadside memorial tucked into the trees and soon wondered who “Joe” was. How did he die? How old was Joe? The flowers were tended, the cross a pristine white amid the warm morning light. I got back in the car and turned the radio off, my energy seemingly zapped by the death of someone I never knew. Maybe I should have flown to Little Rock. I didn’t make it far before stopping again. 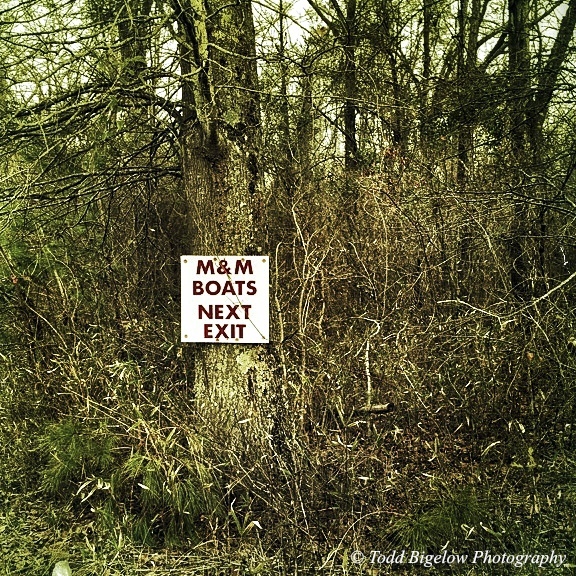 A small sign tacked to the trees was beckoning motorists to boats of M&M’s. I love M&Ms! Just what I needed to cheer me up. But there were no boats of red, blue, yellow and green candies. It was all a lie. That’s okay, I liked the sign anyway, even if it was false advertising. I passed by giant water towers, fields of cattle and giant plumes of smoke. I exited the highway at random much to the chagrin of Siri, my intrepid iPhone navigator, who badgered me to get back on the highway. I just ignored her. I was on a quest and she just didn’t understand, constantly harassing me to get to Little Rock for the next assignment. Keep the journey in mind, I told myself, not the destination. As the hours began to tick by with ease, I couldn’t help but notice the death along the highway. Memorials were everywhere along with the remains of animals. Dead skunks, birds, possums, deer and others too obliterated to identify. I flew by most of them, only catching a glimpse of their former selves in the rear view mirror. But when the now familiar shape of a large animal appeared ahead, I steered to the shoulder and hopped out. It was a frightening sight to see up close. The coyote had been hit and nearly flattened, its’ face eerily reminiscent of a last second scream, perhaps realizing that death was imminent. 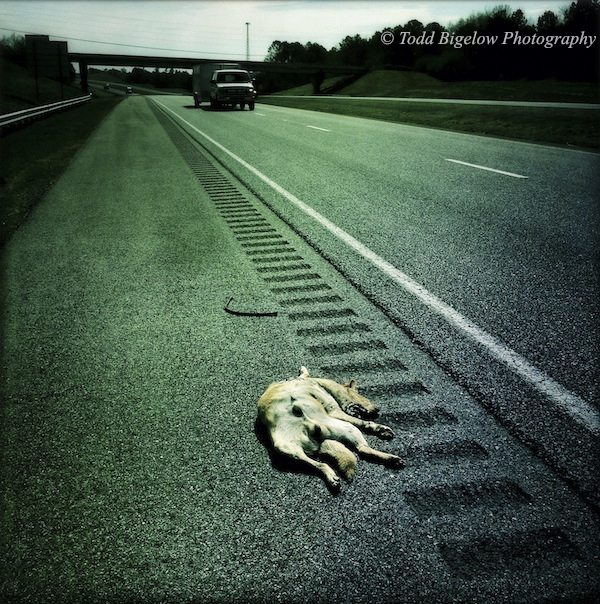 Sad, but if ever there was a symbol of life on the road, I’d venture to say that it’s animal carcasses lining the country highway. A coyote appeared as if it knew death was imminent. I promptly pulled into the Mississippi Welcome Center off the first exit. Truth be told, this is the first welcome center I’ve ever visited in 47 years of existence. I usually fly right by or over them. Literally. It’s kind of like listening to Bob Seger. I mean, really, who the hell listens to Bob Seger? 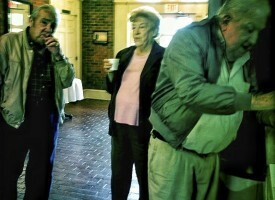 Who the hell goes to welcome centers? A few people wandered about inside. Elvis Presley memorabilia was everywhere. Tupelo, Elvis’ birthplace, wasn’t too far up the highway. That might be cool to see, I thought as I walked back to the car. But when I followed the sign to his birthplace, I got about a quarter mile from the highway before I had to stop, figuring that’s about the limit of “shouting distance,” although I guarantee you my wife could drive much further. But rules are rules, I reminded myself, and I had to live by them. 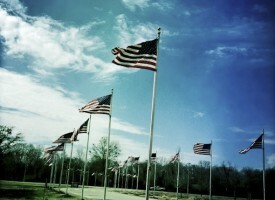 As I prepared to U-Turn, I noticed a park dedicated to veterans adorned with two rows of American Flags. Destiny, I suspected, so I popped out for a few shots. I wish we had trees along the highways in Los Angeles. The dense woods that begin only yards from speeding trucks and cars are beautiful, even when devoid of leaves as they are this time of year. The woods hold secrets and offer a way to stop the madness of life that travels up the road, I’ve always thought. At one point, I exited near a giant water tower, not even sure where I was exactly. I silenced Siri’s nagging voice and took a left. Traveling no further than the length of a football field through the woods, I soon crossed a small, concrete bridge over a muddy river. It could have been a creek, but I’m no expert on these things. A beat-up road sign with bullet holes grabbed my attention so I pulled over and killed the engine. I hopped out and was hit by the noise. The utter lack of it engulfed me. It was dead silent. The woods had taken the noise and swallowed it whole, leaving only the tweets from birds (yes, people, tweets first came from birds) and the sounds from the nearby water. I stood there silently clicking my iPhone for several minutes before turning back to the highway. As the light began to take on the look of midday, the miles started to click by with fewer stops. Was I missing things? Was I in a slump, the photographer’s version of Dwight Howard’s free throw shooting, I wondered? Light has a funny way of messing with what you see. The worse the light gets, the worse things tend to look. Nothing was appealing to me, nothing was jumping out at me and encouraging a brief visit. I remained confident as I pushed on. 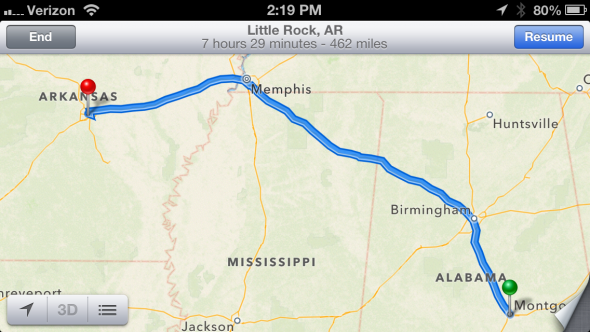 Siri reminded me that Memphis and I40, the great highway linking East and West, loomed ahead. This time, I was thankful for her soothing voice. 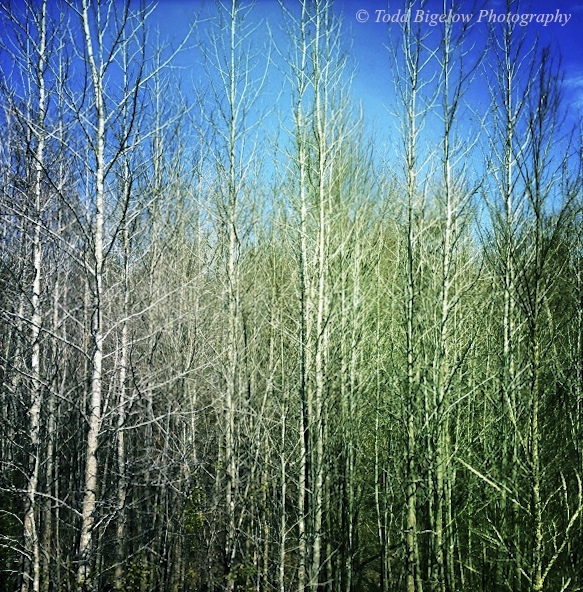 I loved the trees that lined Routes 65 and 78. Shooting at road signs seems pretty common in rural areas. 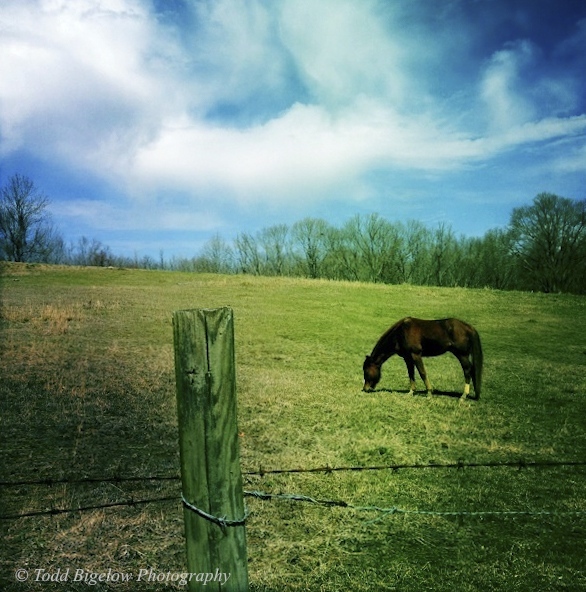 Cutting through the corner of Tennessee and heading west brought new sights and sounds. I was back in traffic, passing long abandoned rows of public housing before quickly emerging into Arkansas. My destination, and my next assignment, drew closer. What still awaited me on the journey remained as unclear as the moment I entered route 65 hundreds of miles and many hours ago. Grazing only feet from the highway. The light began to change again, shifting slowly to longer shadows and bluer horizons. 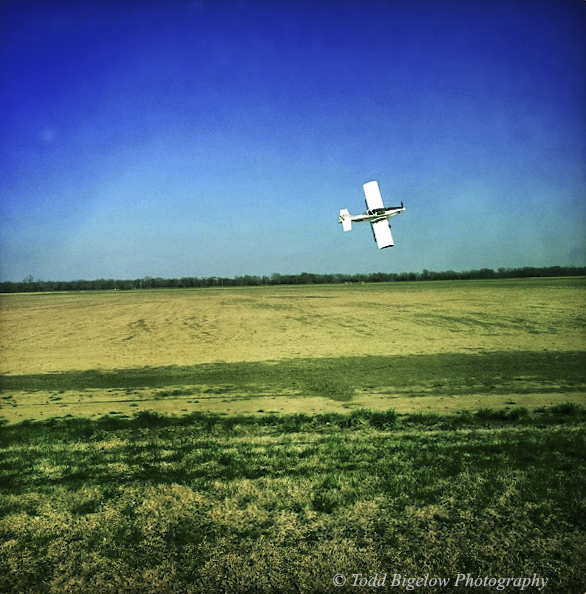 My senses were awakening again from what must have been a short siesta because I was hardly inside the Arkansas border when I saw a very low flying aircraft diving and rising above an open field right off the highway. Crop dusters! Working the crops from the air was a pretty cool sight to see. I prayed the flying farmer wouldn’t stop before I was able to exit I40 and pull onto the gravel shoulder next to the field. I didn’t have to go far, so I was definitely within the shouting distance. And the spraying continued while I clicked away. At one point I waved to the low flying pilot as he made a pass, silently thanking him for making my journey that much better with his acrobatic maneuvers. My spirits buoyed, I flipped a u-turn and got back on I-40. With interstate traffic picking up, I stayed in the right lane as trucks blew by me in the fast lane. I’m usually the one speeding by (well, at least when I’m not in LA where speeding is impossible), so being the slow driver was still a new concept. I wanted to make sure I didn’t miss anything since I knew I would arrive soon in Little Rock. It dawned on me at that point that, for once, I was not interested in getting to my destination as quickly as possible. I was interested in delaying my arrival, in seeing what else the road will offer me en route. So naturally I took the next exit and turned right. “You should ride a bike,” George told me. 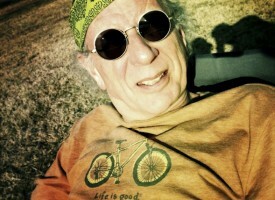 George, a easy going road warrior who looked eerily like the great Larry David. George had stopped to sit in the sun and read his Kindle until the traffic eased. I laughed and told him that what he was experiencing was anything but traffic. He chuckled at my tales of LA driving and encouraged me to take up cycling as an alternative. Last I saw of George, he was still soaking up the late afternoon sun next to his U-Haul, seemingly in no hurry to go anywhere. I guess that’s what life on the road had taught me to that point. Go at your own pace. To hell with Siri and the predetermined routes with estimated times of arrival. It was all up to me, so long as I made my next assignment, of course. Like large American flags flying at the top of towering flagpoles are meant to do, I was coerced into investigating where the flag was flying as I careened through Arkansas. I knew I had already seen and photographed several American flags, but I decided to stop again. 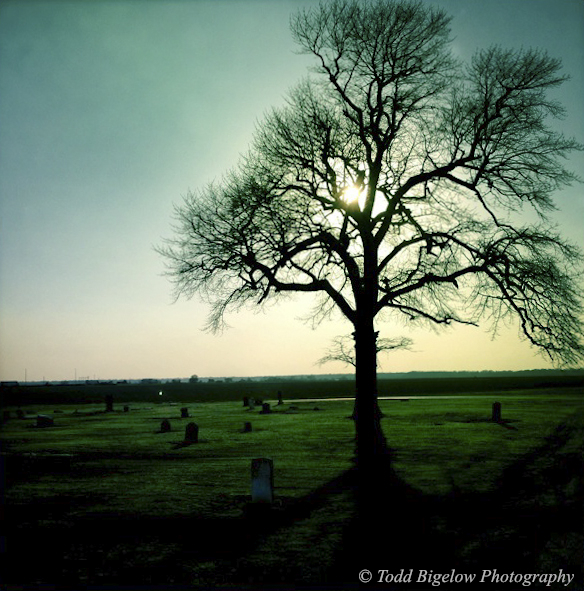 It was an old cemetery located in Carlisle, Arkansas and founded in 1875 along the Trail of Tears. I was saddened by the thought of the Trail of Tears so I called my son, a history buff, to tell him where I was. He said, “Dad, that’s where they forced the Native Americans off their land to move to reservations on the other side of the Mississippi River.” I hung-up and was drawn to the flapping of the American flag flying proudly above the cemetery, thinking of the irony. 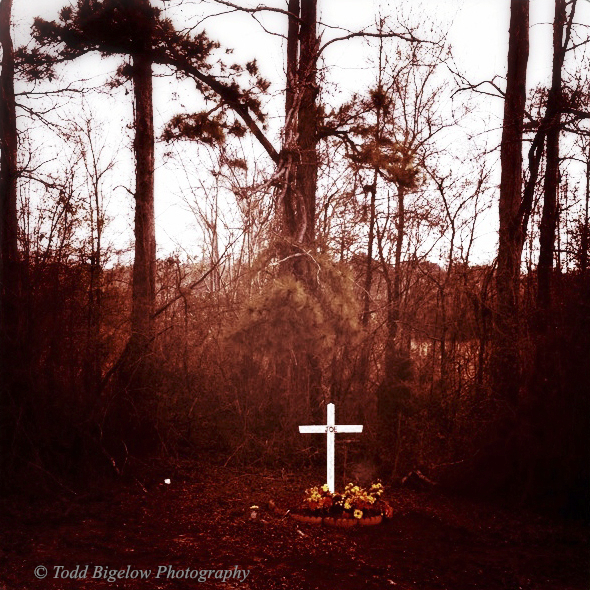 A cemetery along the Trail of Tears. As I began to walk through the old cemetery, I realized there’s something about it that is equally sad and beautiful. The headstones are weathered by over a century of wind blown dust pelting them, names and years etched into them that mean the world to the families but little to anyone else. This was a beautiful cemetery anchored by the towering flag on one side and a towering tree on the other. Motorists roared by on I40 in the background. This was not a cemetery of neat rows and exquisitely trimmed lawns. Barren, yet beautiful, is how I saw it. Flipping down the visor to shield my eyes from the low lying sun, I began the final approach to Little Rock. With seat belt firmly in place and no seat-back tray table to fold-up, my mind wanted to wander to the job that awaited the next day, but I forced myself to concentrate on the last remnants of my journey between two assignments. I still had about fifteen miles to go when I exited I40 again, this time onto a road simply labeled route 15. Fifteen has never been my favorite number, never held any significance or yielded any lottery earnings. Why I turned off is pure speculation. Chance, I guess. A small, murky pond appeared on my left. Nothing grand about the pond except that it took on a wonderful glow as the final rays of sunshine cut through the trees and presented me with a reflection that was a perfect metaphor for my journey. I delighted in my final image of the day, slid the iPhone back into my pocket, pointed the Fusion west and headed to my next assignment, a bit disappointed that my 10 hour drive between two assignments had ended. 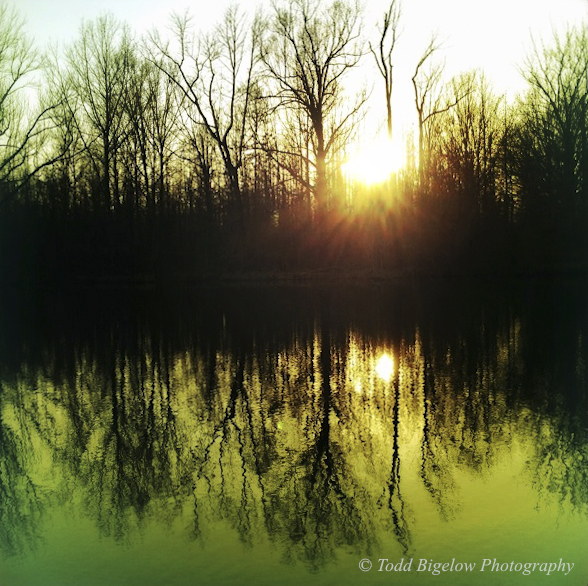 Setting sun reflects off a Arkansas pond as I neared the end of my road trip between two assignments.